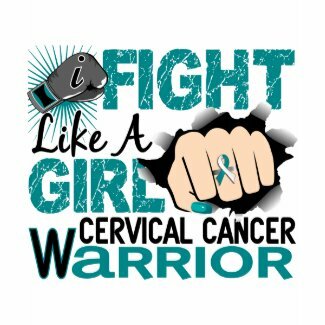 Cervical Cancer warriors, stand strong in your fight against Cervical Cancer with our I Fight Like A Girl Cervical Cancer warrior t-shirts, apparel, merchandise, and gifts featuring the empowering slogan Fight Like A Girl and a woman’s fist wearing a striking teal and white Cervical Cancer awareness ribbon ring and matching teal nail polish. A boxing glove, grunge text, and bold layout complete the look of this empowering Fight Like A Girl design created especially for Cervical Cancer warriors! This exclusive Fight Like a Girl design is available on many t-shirt styles, tote bags, mugs, and lots more merchandise at Fight Like A Girl Gifts, a specialty shop of Awareness Gift Boutique.